Hi everyone! 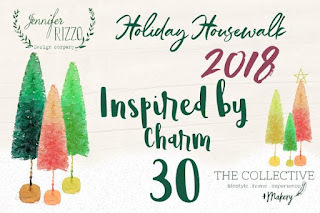 Today, my home is number 31 on The Holiday Housewalk, an inspiring, week-long, online tour of Christmas homes presented by Jennifer Rizzo. If you are visiting from Inspired By Charm, thank you for stopping by and continuing the tour with me! I have to admit it is a little humbling to be the house after Michael's. Every year I look forward to his Christmas decor, he sets the bar pretty high for the rest of us. This year his Christmas at Bayberry House is my favorite Christmas Tour so far! If you did not stop by as part of the tour, please be sure to hop on here and then go back to the beginning to see some absolutely beautiful homes, all dressed for the holidays from all parts of the country. If this is your first time here, let me introduce myself. 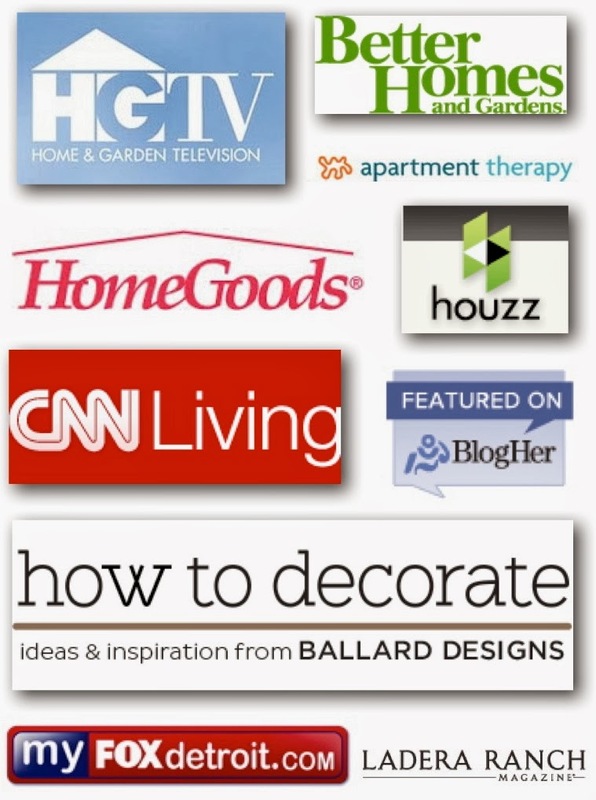 My name is Sarah Macklem, I'm a professional Home Stylist from Detroit, Michigan. 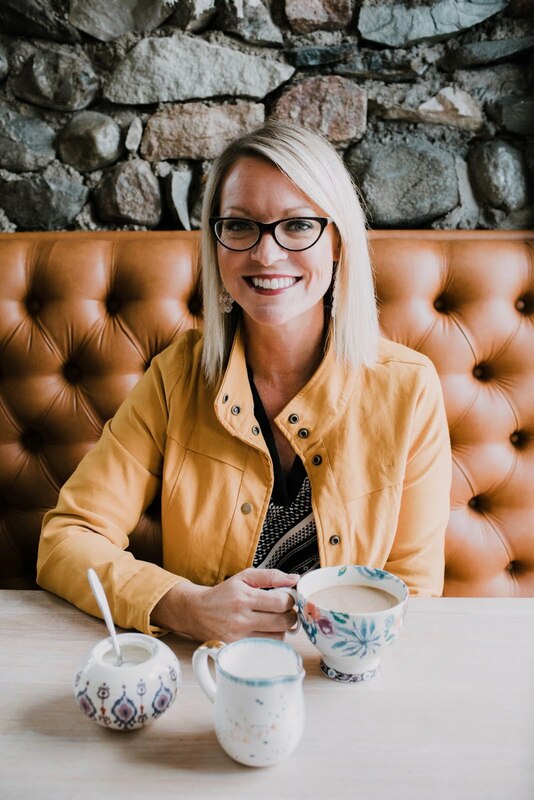 This blog is where I share my daily design adventures along with DIY tutorials, entertaining ideas, exciting room makeovers and more. I operate my busy online interior design studio and often share my professional design work here on the blog. 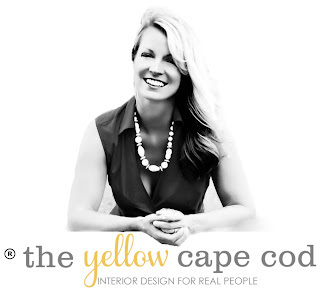 In addition to being the title of this blog, "The Yellow Cape Cod" is my home where I live with my husband, our three children, Murphie the dog, and Biggie the Bunny. Every year, I start our Christmas decorating on the front porch. 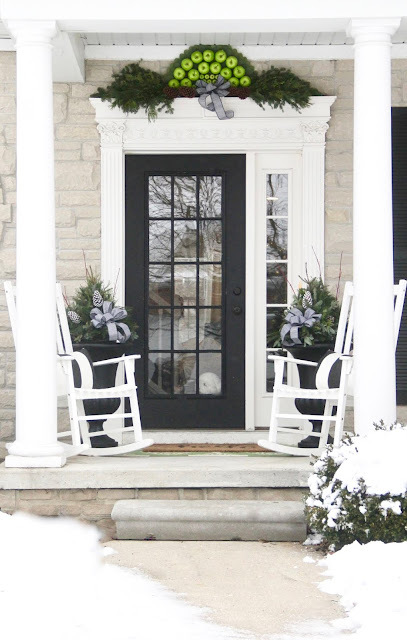 One of the things that drew me to this home when we originally bought it was the trim around the front door. I decided to highlight that this year with a simple, but festive fruit and evergreen arrangement. When I was little, my mom used to decorate over our door using oranges, nutmeg, red apples and pineapple. I put a spin on my moms project and went with a simple, monochromatic look. 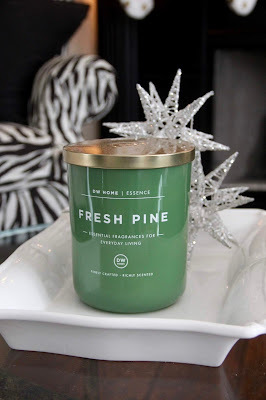 I chose green apples, pine cones, eucalyptus and evergreens. A tutorial on this project is coming to the blog soon! 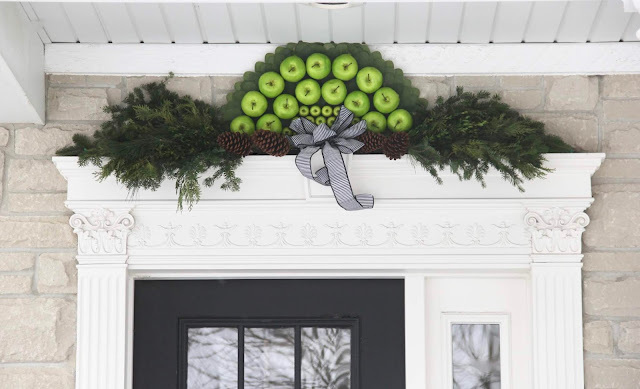 In order to let the apple arrangement get all of the attention, I kept the rest of our porch decor simple. 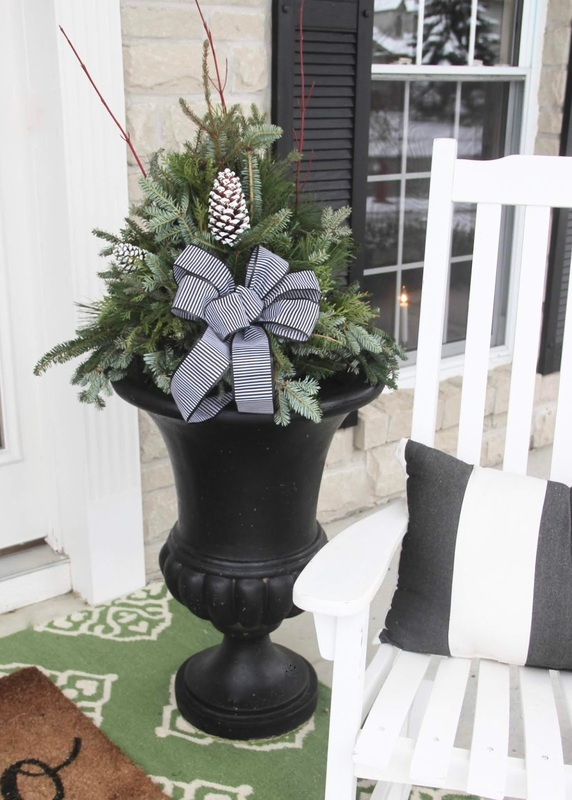 I purchased two beautiful evergreen pots to place in my black urns from a local Charity. 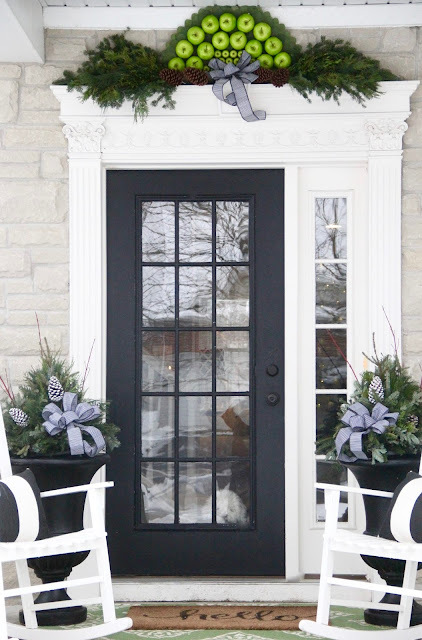 To give them a custom look I switched out the red bows for black and white to match the door swag. To provide a welcoming touch, I layered a wool rug under our door mat. Keep it Simple and Livable, Use What I Already Have, and Start Early. I'd like to give you a tour of our home while explaining how I accomplished these goals. As a Blogger and Interior Designer, this time of year is the busiest time for my business. It also happens to be the busiest time for my family. Especially this year! Keeping the decor simple and easy felt like a great way to enjoy the process and keep it stress-free. 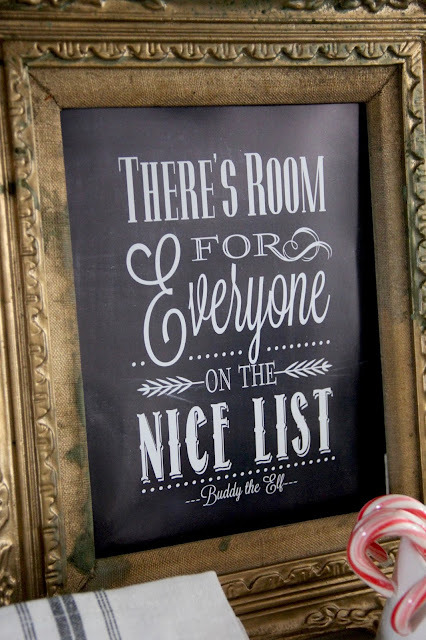 Making sure it was livable meant not going over the top and crowding our living spaces with too many decorations. 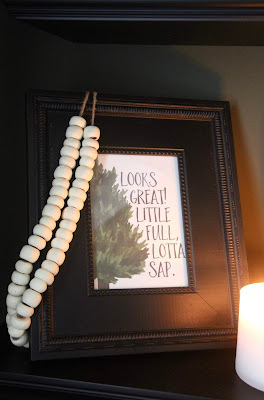 Don't get me wrong, I LOVE over the top Christmas decor and will probably go back to it next year, but for this season, simple works best for us. 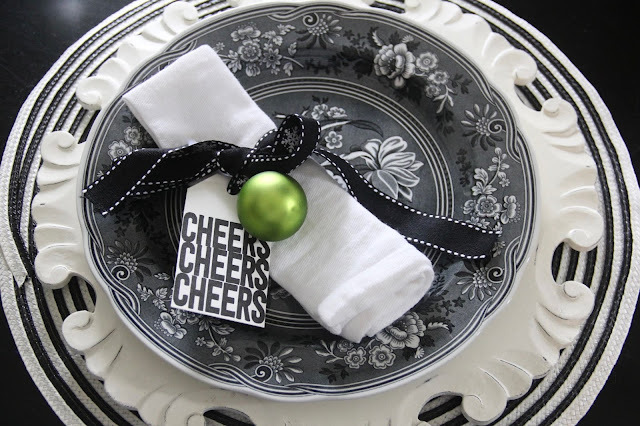 One way I am keeping the decor in the dining room livable is by creating a simple table scape for our holiday meals. 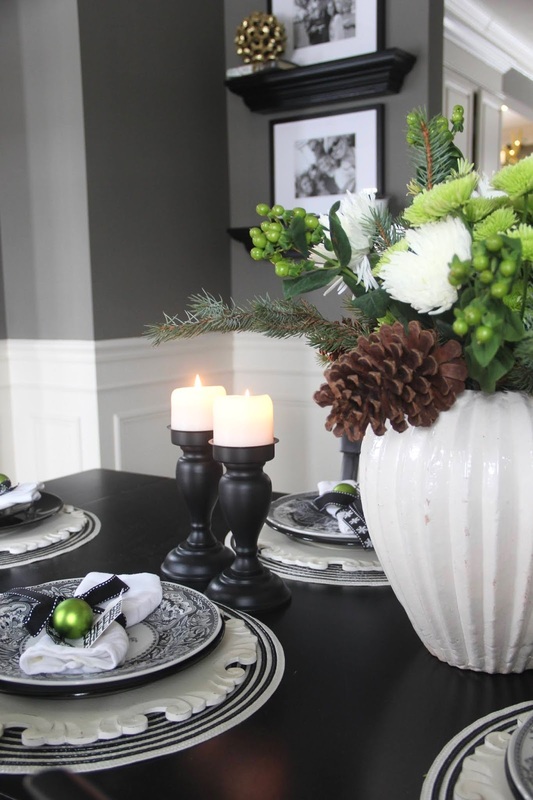 I created a festive centerpiece by adding tree clippings and pine cones to grocery store flowers. 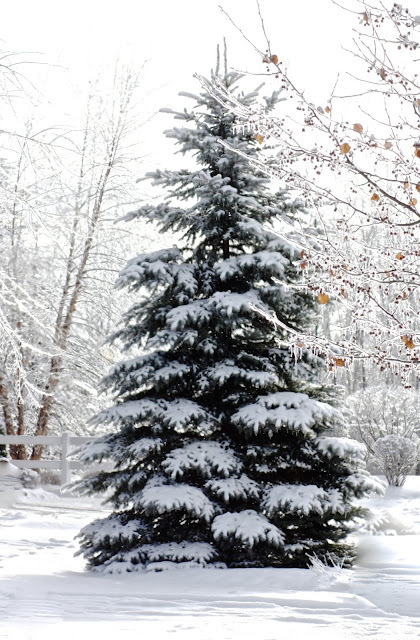 Throughout the season, as I shop for groceries, I can swap out the flowers as needed and keep the greenery and pine cones in place. This creates an impressive look that is easy to maintain for weeks. The dining room is officially ready for guests and family dinners. The second item on my priority list this year, trying not to purchase anything new, was pretty simple to accomplish. As a blogger who has been decorating my home for Holiday Home Tours now for 10 years I've accumulated a lot of pretty holiday decorations. (Yikes, has it really been 10 years of blogging...yes it has!) I challenged myself to create a fresh, new, holiday look while using the things that I already had, and love. 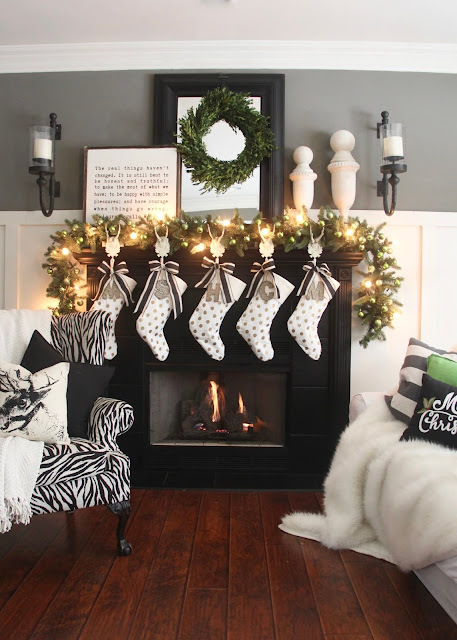 I kept our everyday mantle styling in place (sconces, artwork, mirror and finials) and embellished it with greenery, bows and stockings. 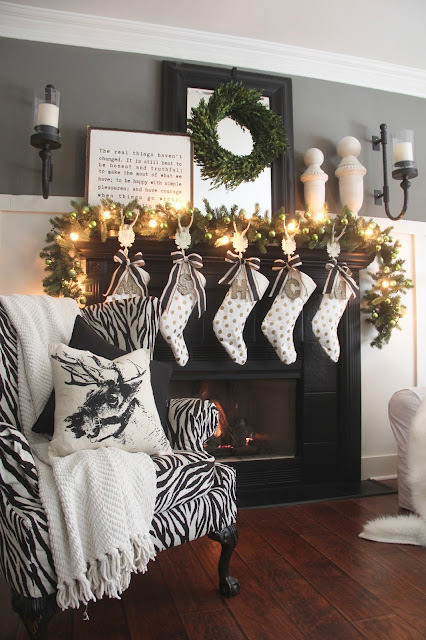 We've had these antler stocking holders (Ballard Designs) for a few years now and I love the way their white silhouettes pop against our black mantle. 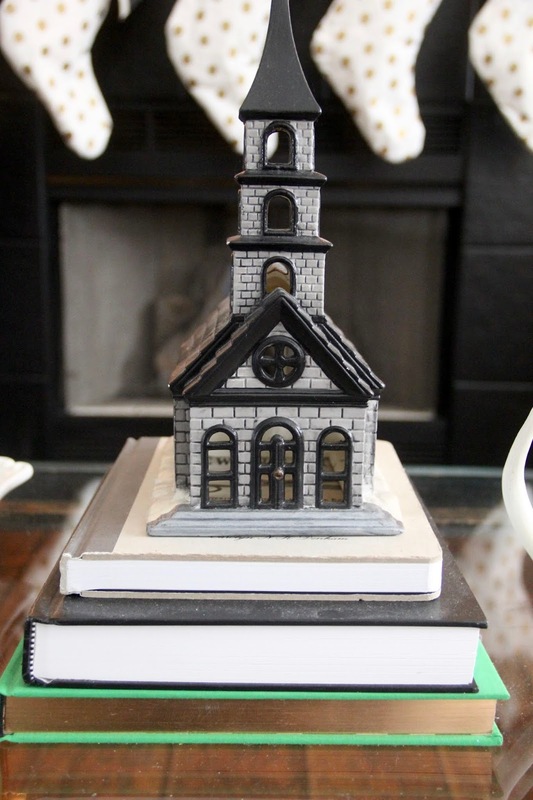 To lend a nod to the black, white, and green mantle, I styled our coffee table with a yummy candle, a stack of books and my little black and gray church (an old thrift store find). 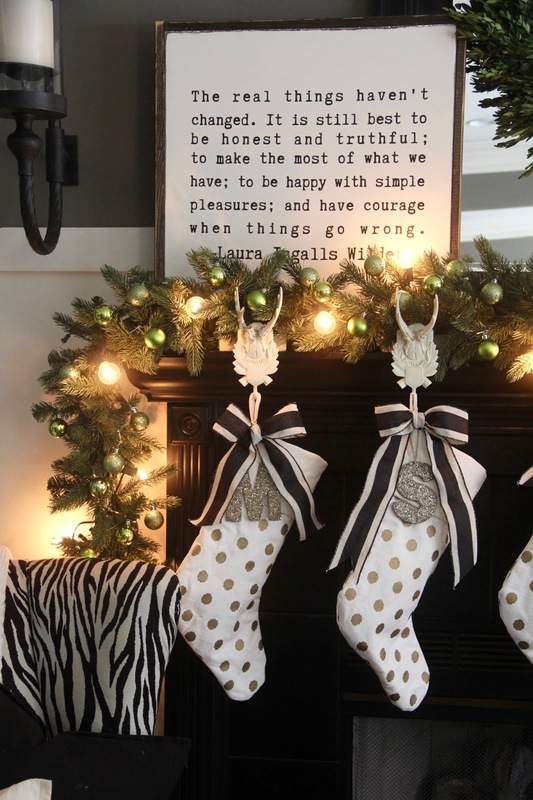 A few years ago, I picked up these fun gold and white polka dot stockings on clearance from Potterybarn. 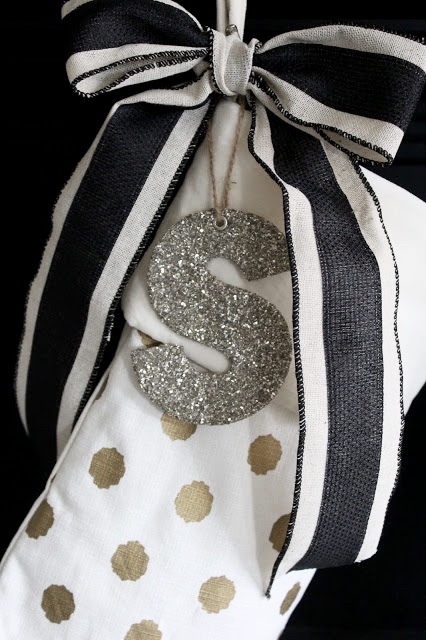 To give them a custom look, I added a black and white bow and a German Glitter monogram ornament to each one. Back to my list of priorities...the third one... starting early...this is a tricky one. In order to get our decorating done in time for this tour each year, I usually start right brainstorming right after Halloween. Finding inspiration and getting in the spirit of Christmas when it's not quite time yet is sometimes a little challenging. This year, I started thinking about what direction I wanted to take and felt a little stuck at first. 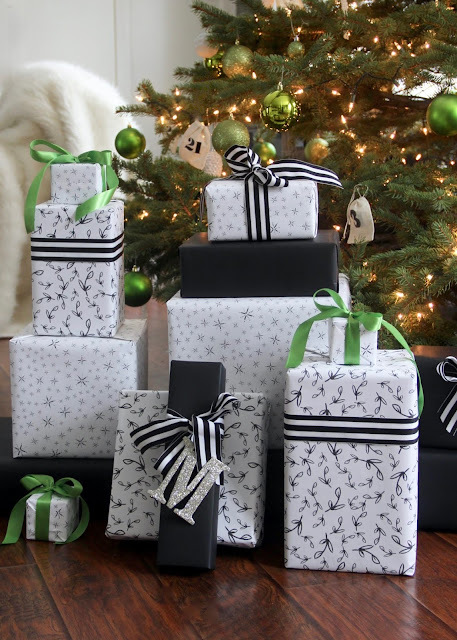 I was packing away the Halloween decorations and trying to wrap my brain around Christmas and come up with a new, exciting decor theme... when it hit me. One of our most exciting family milestones occurred this year. My daughter, Hannah, graduated and started attending college at Michigan State University. What better way to wrap up the year, than to celebrate her accomplishment by using her school colors in our Christmas decor? 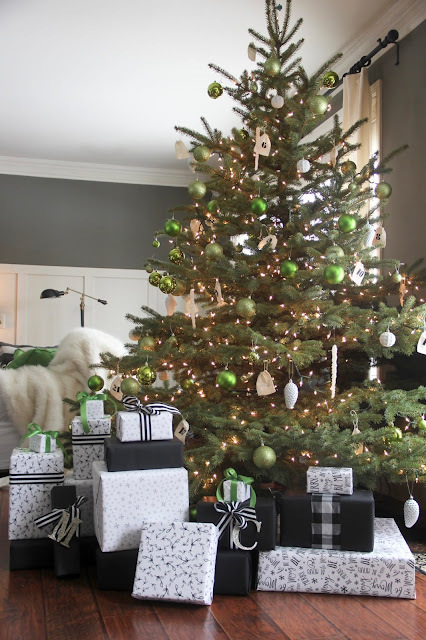 Welcoming her home for the holidays with a Sparty Green and White theme was all the inspiration I needed to get started. 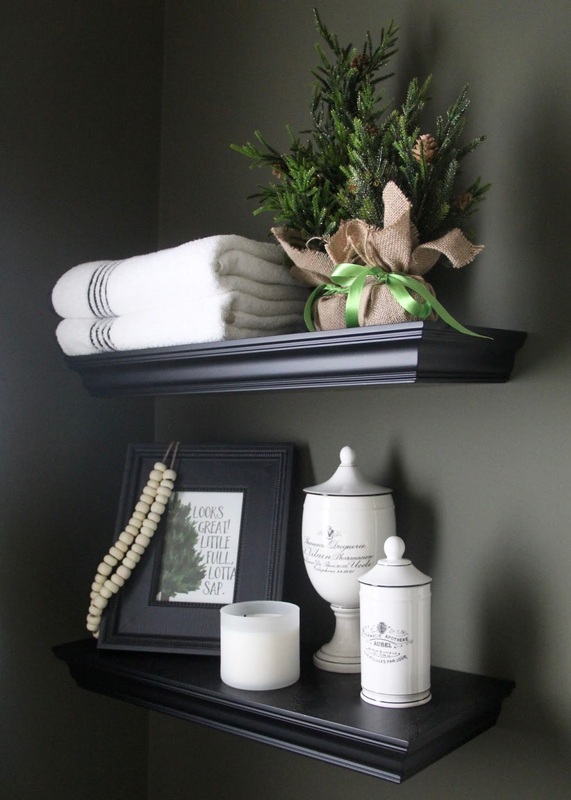 Most of the main decor items that I've accumulated over the years are neutral. By switching out the colored balls, babbles and ribbons, I was able to create a fresh new look. This is where I did have to make a few new purchases, the green Christmas balls are new, but were very economical. 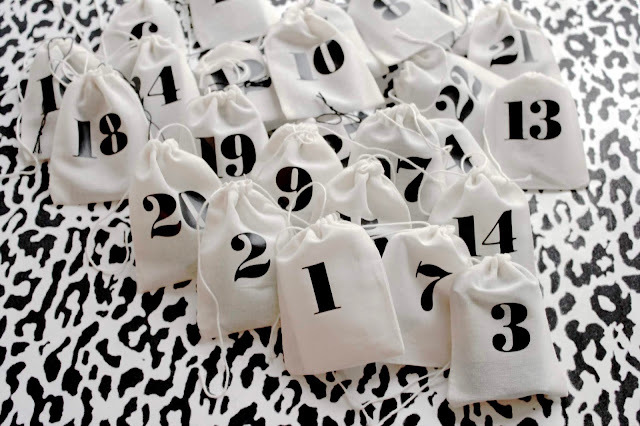 Our Advent bags always make an appearance somewhere, this year I put them on the oversized fresh tree that we cut down as a family the weekend after Thanksgiving. If there is one Christmas decor item that is always on our list it's a fresh cut tree. We just started this tradition a few years ago by request of our youngest son. Visiting the local tree farm, Nicklas Tree Farm in Metamora, to cut down a tree is now one of our families favorite days of the year. Thanks to Etsy you can find just about any favorite movie quote in the form of a printable. Stick it in a cute frame and you have Christmas art for just a few bucks. Another tradition in our home is one that not all of us agree on. The forcing of paper white bulbs. The scent to me says Christmas, but to some other occupants of our home, it says something else. Not everyone in our house is a fan of the smell of paper white blooms, but they sure are pretty in front of the my DIY chalkboard art. You may remember a few years ago I hand wrote the lyrics to O' Holy Night on an old mirror that I painted with chalkboard paint. And no Christmas would be complete without the decorating of the chandelier in our breakfast nook. This year, I'm forgoing a centerpiece and fancy table scape on this table to leave a little extra breathing room (and more room for food). I've noticed how having less holiday decor has allowed the things I did do to become more important. 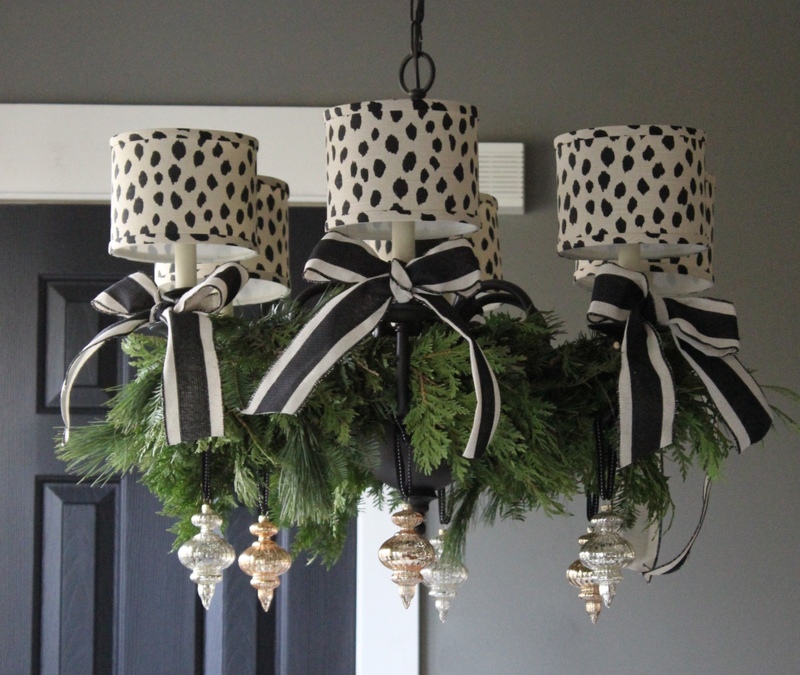 The chandy is getting all the attention this year, and I'm not mad about it. In the end, I'm pretty happy to report that for the most part, I stuck to my three priorities. I may still add to our holiday decor as the season continues, but for now, I'm enjoying what I've done so far. It feels good to know that I didn't spend a lot and that I was able to give our home a different look this year using the things I've used for many years now. 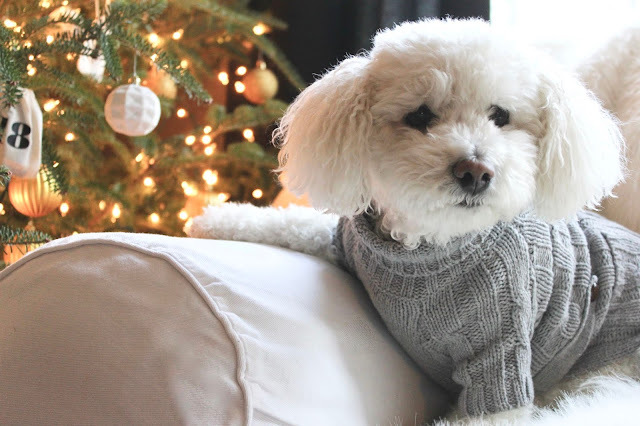 What I'm really excited about is how scaling back the amount of Christmas decor this year has brought a sense of calmness and serenity to our home. 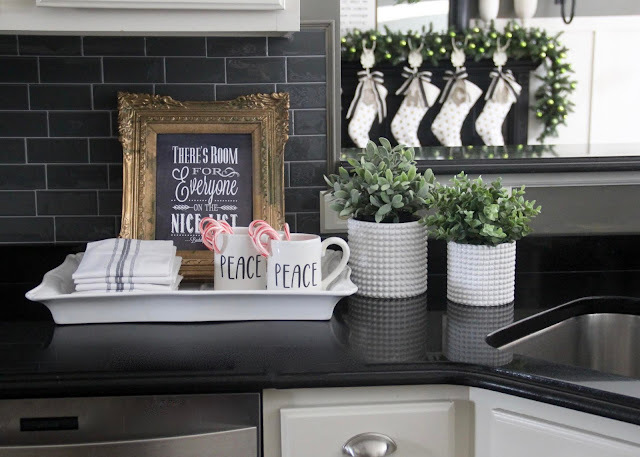 There's enough magic to create a festive atmosphere, while leaving space for entertaining and everyday life. With the exception of our fresh cut tree, which it absolutely huge and takes up half the living room. I wouldn't change that, however, because, it's a beaut. And, because it's something we all decided on together and decorated as a family. I loved having you here and hope you come back next week. 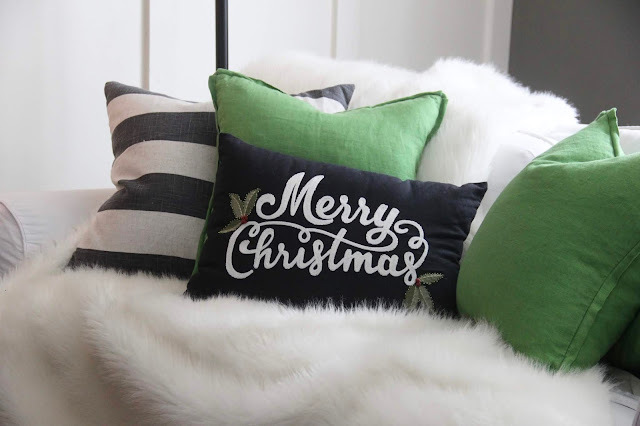 I be sharing some quick and easy Holiday Decor DIY Tutorials as well as a few exciting room makeover reveals! 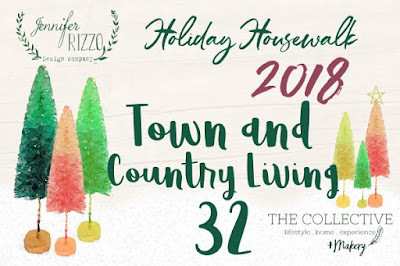 Now, it's time to continue the Holiday Housewalk over at Town and Country Living. She has an amazing Christmas decor aesthetic. Her home is truly magical! To go back to the beginning of the tour, please click here. Thank you, Jen Rizzo, for inviting me to join the Holiday Housewalk 2018! Back to the Design Studio! 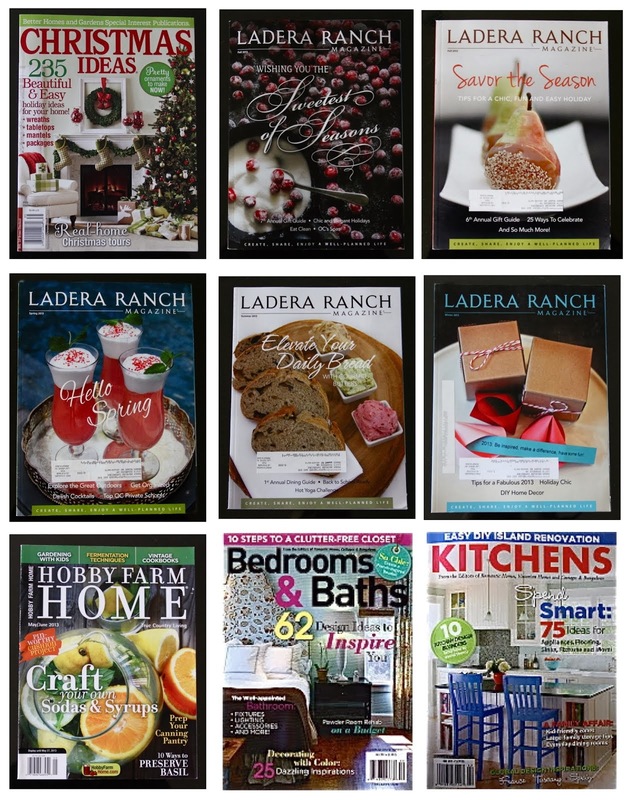 We currently have openings for new Online Design Projects (E-Design). If you're interested in getting started on a room makeover in your home, please click here to make your reservation.